The ongoing protests over a planned PX plant in Maoming are receiving a lot of attention within China. The protests in Maoming, Guangdong over a planned PX plant continue to grow. The original protest, which took place on Sunday, reported turnout of 1,000 marched to show their opposition to the plant, citing environmental and health concerns. A follow-up protest on Thursday was ever larger, according to a report from Radio Free Asia based on eyewitness accounts. “I am here at the scene right now, and there are probably upwards of 20,000 people here [outside the government buildings in Maoming],” one source said. Another source on the scene estimated the number of protestors at “definitely much more than” 1,000. The protests have also spread geographically, branching out to other cities in Guangdong. Following Tuesday’s protest in Guangzhou (the capital of Guangdong province), around 20 protestors gathered in Shenzhen on Thursday to protest the PX plant. South China Morning Post reported that the Shenzhen protestors were “taken away by police” after about 10 minutes. Police responses to the protests have become as touchy of an issue as the plans to build the PX plant. The protests in Guangdong were motivated at least in part by a desire to draw attention to violent methods used to disperse protestors in Maoming. The BBC said it has received reports of police in Maoming using clubs to beat protestors as well as using tear gas and pepper spray to disperse crowds. The BBC cautioned, however, that it could not verify these claims. Rumor has it that police killed 15 and injured 300 during the original protest in Maoming. In a press conference [Chinese], Maoming’s deputy director of public security Zhou Peizhou denied these claims, but admitted that over a dozen people were “accidentally” injured in clashes between police and protestors. According to Maoming officials, the city’s hospitals treated 15 wounded in the clashes, including four police officers. Zhou claimed that rumors of police brutality originated from pictures of casualties from a fatal traffic accident that occurred early on Monday morning. As rumors about Maoming fly, social media accounts of the protests are a sensitive issue. The website Free Weibo, which offers “censor free” Weibo searches, showed many posts containing the Chinese characters for Maoming that had already been deleted by censors. China Digital Times noted that on March 31, the day after the original protest, searches for “Maoming” and “PX” were blocked on Sina Weibo. However, “Maoming” was not a banned search term on Sina Weibo as of 12:30 EST on Friday. One uncensored Weibo post even combined two potentially sensitive topics by asking readers to sign a White House petition that urges U.S. President Barack Obama to call Xi Jinping and request an end to the violence. China Digital Times’ archive of censorship instructions issues by government offices included the following bulletin from the Guangdong Propaganda Department: “All websites are kindly asked to take care to delete all calls for protest in Guangdong.” But as of Friday, there was no evidence from CDT’s sources of national-level edicts from the State Council Information Office on coverage of the Maoming events. Even the Guangdong Propoganda Department didn’t mention restrictions on discussing the protests that had already occurred. Meanwhile, an English-language article in Xinhua called the protests an example of “the quandary for a local government seeking a balance between development and stability.” In the article, Xinhua outlined the Maoming government’s campaign to drum up public support for the PX plant, including positive reports in the local newspaper and the mailing of 100,000 brochures detailing the economic benefits of the plant. Yet Xinhua noted that these efforts backfired, instead rallying public opposition to the plant. If that’s the case, it will be difficult for government officials to placate protestors, given that a credibility crisis was the original cause of the protests. In Thursday’s press conference, Deputy Mayor Liang said that the city government “has always placed a high level of importance on the people’s health and the protection of the environment.” Liang added, “We absolutely will not begin this project before society has achieved consensus.” If Maoming’s protestors believed that, they would not have taken to the streets in the first place. 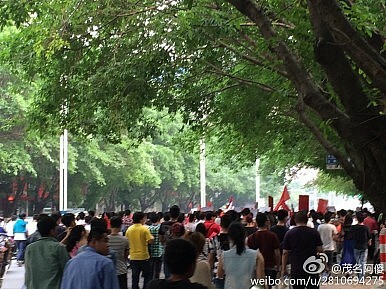 Protestors in Maoming and Guangzhou tried to prevent the opening of a PX plant in Maoming, Guangdong. Xi Jinping: China's First Social Media President?Zai Jian, Peppa PigChina’s Weibo Hires 1000 ‘Supervisors' to Censor ContentFarewell VPNs & Independent Multimedia Content: China Vows to Clear Network SpaceChina Tightens Censorship: Farewell, Celebrity Gossip?